Fifty Shades Darker Trailer: Mr. Grey Is Back! After taking in over $569 million worldwide during its theatrical run, Fifty Shades of Grey will be released on Blu-ray and DVD May 8. The release arrives with a Fifty Shades Darker teaser, as the sequel has already been given a February 10, 2017 release date. We showed you a photo from this sneak peek last week, but now the full video has arrived online. It showcases the return of Christian Grey (Jamie Dornan) as he gets ready for a big party. 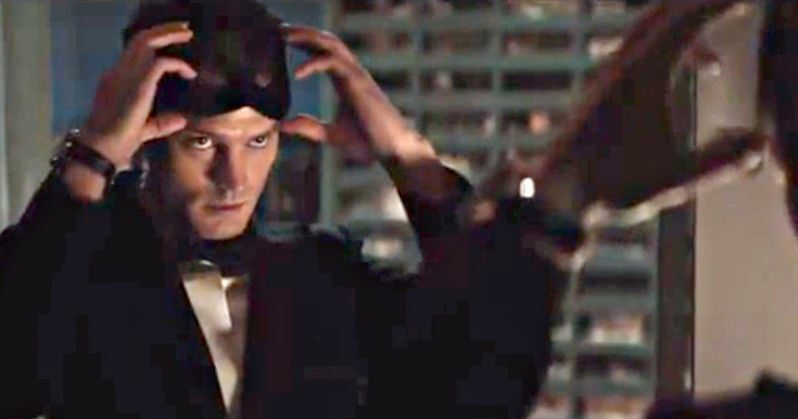 The Fifty Shades Darker novel does feature a masquerade ball, so we know that element of the story will be included in the adaptation, but there isn't much else we know about what will be included from the book in this theatrical sequel. Universal Pictures chairman Donna Langley recently spoke about the follow-up, which she describes as "more of a thriller." The plot of the book finds Anastasia Steele breaking off her relationship with Christian Grey to start a new career at a Seattle publishing house. But when Christian proposes a new arrangement, Anastasia cannot resist. She soon learns more about her lover's harrowing past while confronting the anger and envy of the women who came before her. Fifty Shades Darker doesn't have a director in place quite yet, but we reported last week that author E.L. James' husband, Niall Leonard, has signed on to write the screenplay. Donna Langley revealed that Niall Leonard actually wrote a draft of this year's Fifty Shades of Grey, although he didn't receive any screen credit. "He actually did a draft that wasn't credited on the first movie, and he did a really good job." There had been talk of friction on the Fifty Shades of Grey set between director Sam Taylor-Johnson and author E.L. James about the movie's sexual content and various other issues. Sam Taylor-Johnson and screenwriter Kelly Marcel are not coming back for the follow-up, but Donna Langley addressed the rumors of creative tension. "For the record, the movie we ended up making is exactly the movie I wanted to make and that the studio wanted to make and that our director wanted to make." Dakota Johnson (Anastasia Steele) and Jamie Dornan (Christian Grey) are returning for the sequel Fifty Shades Darker, but no other cast members have been confirmed at this time. Fifty Shades of Grey also starred Luke Grimes, Jennifer Ehle, Eloise Mumford, Rita Ora, Marcia Gay Harden, Max Martini and Victor Rasuk. While we wait to see which of these cast members will return for the sequel, take a look at the brief Fifty Shades Darker trailer below.